Solar PV is the flagship technology of the distributed energy philosophy due to its modular nature and low maintenance requirements. The potential for distributed PV to displace conventional generation, transmission and distribution capacity is also limited by several factors. Distributed generation has been around for a very long time, but has recently received a new lease of life thanks to the very impressive price reductions of solar PV. The reasons why affordable solar PV is commonly deployed in a distributed manner are obvious: solar PV is highly modular, can be installed on rooftops and requires little maintenance. The alternative to distributed generation is the standard utility model that delivers the vast majority of our electricity today. Large generators are built to take advantage of economies of scale and the generated electricity is transmitted to population centres over a high-voltage transmission network. The majority of generators in this system are dispatchable, thereby allowing the system to follow load. This article will take a closer look at the comparison of distributed vs. utility scale with a special focus on solar PV. Since solar PV is the flagship technology for distributed generation, but utility scale offers a myriad of attractive alternatives, this comparison should provide an optimistic view of the potential of distributed generation. The first and most obvious factor to consider is cost. It can be intuitively understood that building a 100 MW utility scale solar park will be substantially cheaper than installing 2 kW of solar on the rooftops of 50000 unique homes. Equipment can be transported to the site in bulk, the installation process can be standardized to a greater degree, the hazards and challenges of rooftop installation are avoided, larger inverters and lower-efficiency panels can be used, and O&M activities can be carried out more efficiently. Another important consideration is that utility solar does not consume any of the time and initiative of the customer. In the US, utility scale capacity can be installed for less than half the cost of the distributed options of residential and commercial solar (see above). It should be noted, however, that costs are given in terms of DC capacity and utility scale solar farms are often constructed with a substantial DC overbuild in order to boost the capacity factor (see below). When only looking at small scale distributed projects, scale also plays an important role. For example, in the Australian market where distributed solar is cheaper than in the US, solar installations (subsidies backed out) vary from $3.13/W for 1.5 kW systems to $2.23/W for 10 kW systems. It is therefore clear that scale remains a significant factor despite the highly modular nature of solar PV. Utility scale solar can be as little as half the cost of distributed solar and scale also plays a significant role in the cost of different distributed systems. It should also be noted that, as panel prices decline further and BOS costs become increasingly important, this difference between utility and distributed solar capacity costs can only increase. Capacity factor is a very important consideration because it not only directly affects the levelized cost of solar PV, but also the capacity value (next section). Capacity factor considerations impose substantial limits on the potential of distributed solar for two primary reasons: the panels must be located at the point of consumption and panels are almost always fixed and rarely placed at an optimal angle. 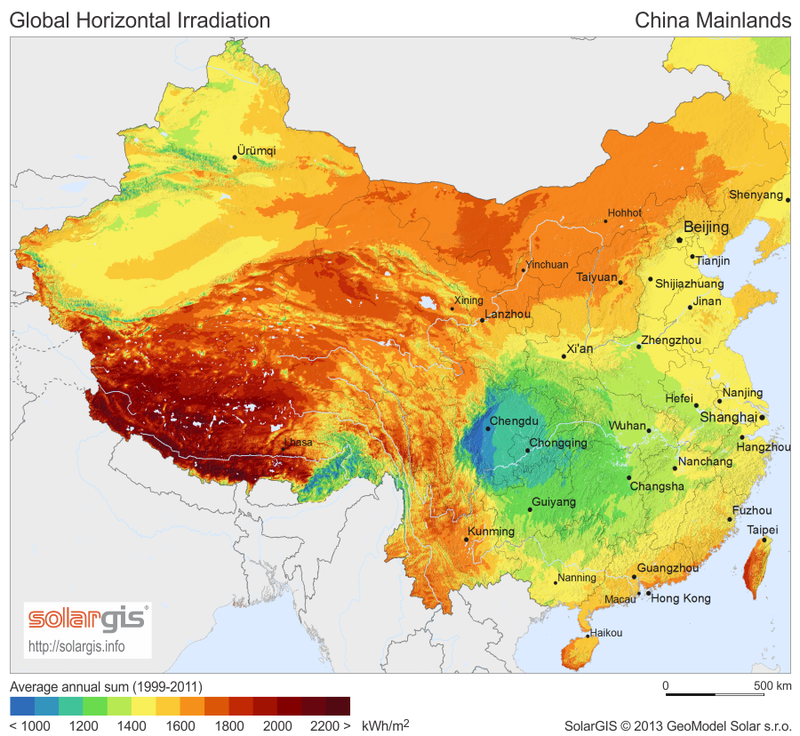 In contrast, utility scale solar can be located in areas of very high solar insolation and often use tracking systems or oversizing to enhance capacity factors. The restriction on panel location is the most important point. It is well known that per capita economic productivity is a strong function of average temperature around the globe (see first figure below). This simply implies that the majority of economic activity (and energy consumption) takes place in locations with relatively low solar insolation. 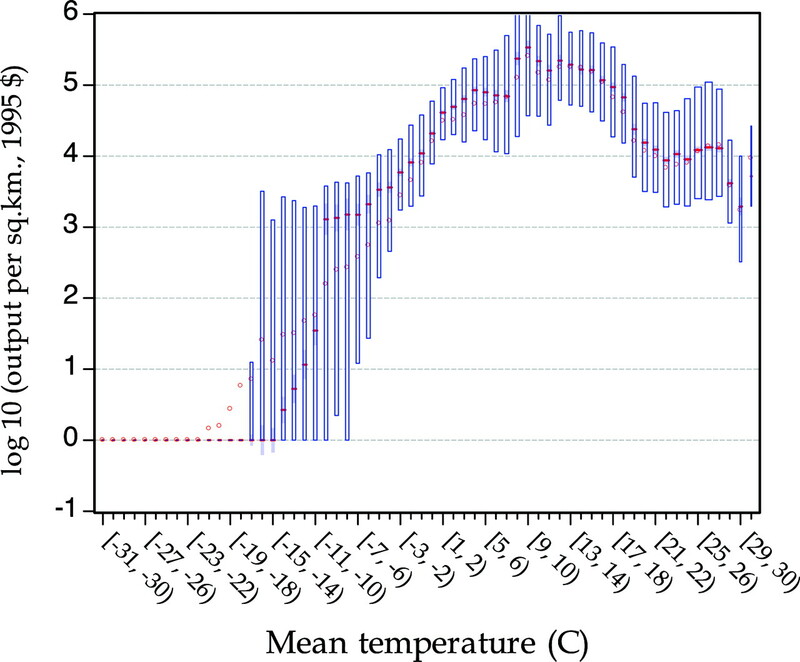 Even when correcting for the fact that population densities in moderate climes are often higher, areas with relatively cold average temperatures between 1 and 15 deg C produce the highest economic output (see second figure below, noting the log-scale). China offers a very good example of this phemomenon as illustrated in the two images below. 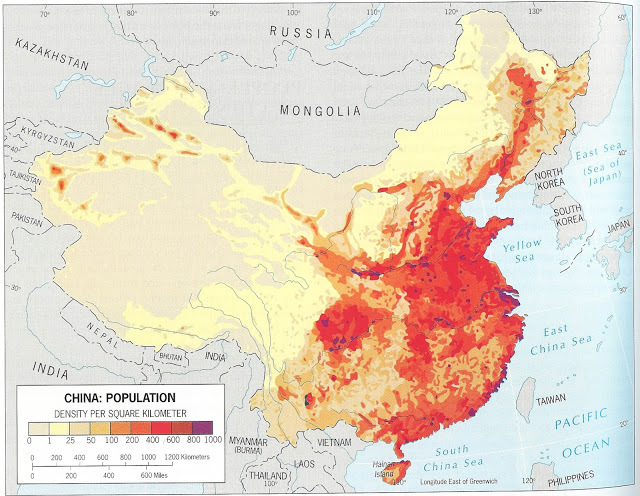 It is clear that the vast majority of Chinese population and economic activity takes place in regions with the poorest solar insolation. When using a standard performance ratio for rooftop solar of 0.75, it can be estimated from the figure below that the average capacity factor of Chinese distributed solar will be only 11% which is about on the same level as Southern Germany. In many locations, however, utility-scale solar parks located only a few hundred miles from population centres can achieve capacity factors in excess of 20% (or 25% if tracking systems are used). This is a very large advantage. When estimating the value of distributed solar, the capacity value is used to calculate the avoided fixed costs (generating, transmission and distribution capacity) which can be added on top of the avoided variable costs (primarily fuel). These avoided capacity costs can substantially enhance the value of distributed PV. In comparison to utility scale solar, distributed solar can potentially avoid transmission and distribution capacity as well as line losses. However, without additional investment in storage and demand response, distributed solar can only claim this additional value under three conditions: 1) demand peaks in summer, 2) penetration is low and 3) some actual investment deferral is taking place. These conditions greatly restrict the capacity value of distributed PV. 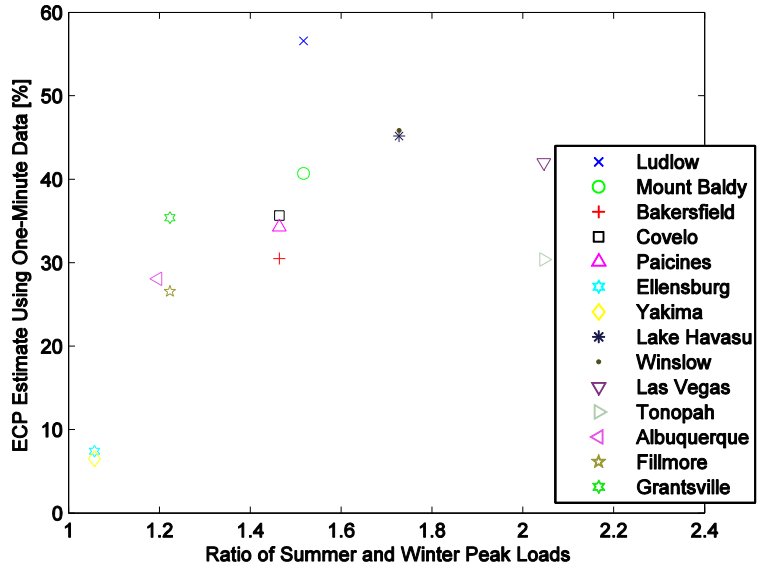 As for the first condition above, the following graph shows how the capacity value reduces to zero as the ratio of summer and winter peaks approaches 1. As a rough approximation, it can be stated that the transition from summer to winter peak occurs around 40 degrees latitude. As can be deduced from the economic activity graph above, a lot of energy is consumed above this latitude. When it comes to the second condition, it is generally accepted that the capacity value of additional PV installations decreases quite rapidly with the amount of solar PV already in the system. The reason for this is simply that the changes that distributed solar make to the load profile create an increasingly poor match between load and marginal solar installations as penetration increases. 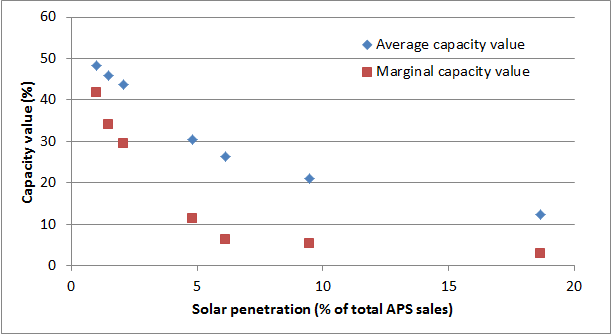 As an example, this recent study conducted in sunny Arizona found that the capacity value of additional PV installations (marginal capacity value) decreases sharply from around 50% at negligible penetrations to around 10% at 5% penetration and less than 3% at 20% penetration (see below). The third condition above simply states that distributed solar cannot displace capacity that is already built. In a stagnant/declining electricity market (most of the developed world), an increase in reliable distributed PV capacity (actual capacity times the average capacity value) will only add capacity value when existing generators and transmission lines are retired and replacements are actually not built. Given the long lifetimes of such power infrastructure, the actual capacity value of distributed PV built today is quite low even when the theoretical capacity value is high. In rapidly growing developing nations, however, the situation is much more positive and distributed solar PV can defer near-term investment into new generation and transmission infrastructure (if the buildout is very well coordinated). It is therefore clear that the global potential for distributed solar to displace generation and transmission capacity is quite low. In the case where solar capacity value is zero, displacing only gas-fired power using a $6/MMBtu gas price and a $30/ton CO2 price would create value of around $50/MWh, requiring distributed solar to be installed for roughly $700/kW (30 year lifetime with no degradation, 15% capacity factor, 6% cost of capital & $15/kW/yr O&M costs). In the event of minimal displacement of transmission capacity, the lower capital costs and higher capacity factors of utility scale solar would clearly be preferred. Utility solar can also be deployed in a much more structured and coordinated manner in order to ensure that maximum investment deferral is ensured. The world is becoming increasingly urbanized and, as a result, energy consumption is becoming increasingly concentrated. In this environment, the low power density of solar PV creates another challenge for distributed solar. As a rough quantification of this challenge, data from this source can be used to calculate that rooftop solar has the potential to contribute energy at a rate of roughly 1.2 TW (in comparison to a 17 TW global consumption rate) if 20% of all rooftop area is covered in 20% efficient solar panels. The 20% rooftop area availability is based on this NREL review and the 20% efficiency will be realized around 2030 if the current rate of efficiency increase of 0.3%/year can be sustained. If we assume that most of the distributed capacity will be installed in regions where it has the potential to actually defer a significant amount of capacity investment, this potential reduces substantially. As a first indication, the map below shows the large amount of electricity consumption above and around the 40 degrees latitude line mentioned earlier where solar PV loses its ability to displace generation, transmission and distribution capacity. 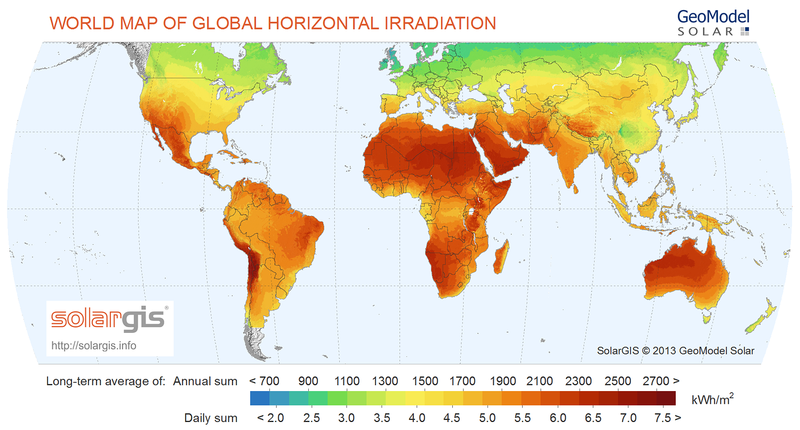 When also considering the distribution of solar resource shown below, regions with good rooftop solar potential (high local solar insolation and economic activity) appear to be limited to the Southwestern US, Mexico, Brazil, the Middle East, India and Indonesia. In these regions, very cheap fossil energy in the Middle East and plentiful hydro in Brazil will slow deployment, while India and Indonesia are simply too poor to afford uneconomical solutions like rooftop solar at any significant scale. But distributed PV is not only limited to rooftops. Ground-mounted MW-scale distributed solar can further extend the deployment potential and, as shown below, can also be substantially cheaper than rooftop solar. However, ground mounted arrays typically have a lower power density than rooftop solar since the panels must be spaced in order to avoid casting shadows on each other. The requirement of having to be close to the point of consumption will greatly limit MW-scale distributed solar arrays. At a generous power density of 10 W/m2, a 10 MW solar farm will require 1 km2 of land which will be difficult to site close to population centres. In rapidly growing regions, this is an especially challenging problem because a large area in close proximity to the population centre will become unavailable for development over the next three decades. In rich nations with limited further expansion potential, citizens are likely to complain about the visual impacts of larger scale distributed solar in close proximity to population centres. Distributed solar is often described as having numerous other benefits such as stimulating local economic activity and enhancing system resilience in the event of a hurricane or terrorist attack. However, whenever the marginal costs of distributed solar PV exceed the marginal benefits, any job creation from PV deployment will be more than cancelled out by job destruction caused by higher energy prices. There are also economic inefficiencies involved in a distributed solar PV rollout such as the wealth transfer from those without solar PV to those with solar PV caused by net-metering, the boom-bust cycles typifying subsidized renewable energy rollouts and the underutilization of existing generation and transmission capacity. The effective benefit of distributed solar under extreme events is also very hard to quantify and not without risks. This report details the risk of “islanding” when a utility is no longer supplying power. Islanding could endanger line workers and damage utility and customer equipment. On the positive side, there is a potential that intelligent use of storage and demand response through an extensive smart grid could significantly increase the capacity value of distributed solar PV. However, as will be discussed in more detail in the next article, these options face large challenges of their own and may well be more economic and practical when applied to the utility model. 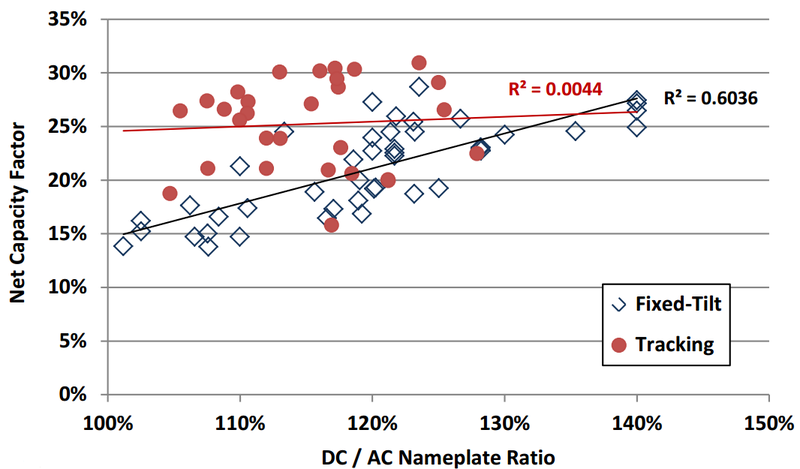 This analysis suggests that utility scale solar is a better solution than distributed solar. Distributed solar is substantially more expensive, achieves lower capacity factors, has limited potential to displace conventional capacity, and faces hard limits from power density considerations. This does not mean that distributed solar will not see significant deployment though. Distributed solar still maintains its great ideological attractiveness among laymen and can therefore secure a very favourable policy environment. However, as Europe is presently demonstrating, such ideologically driven policies are highly unsustainable. For example, solar PV deployment in Germany slumped by 57% in 2013 from 2012 and another 44% in the first half of 2014. Japan is the next nation attempting this experiment and it will be interesting to see how things turn out. Recent reports show striking similarities to the German case, implying that the outcome may very well be similar as well. It will probably take a few more such high-profile boom-bust cycles before fundamental arguments such as those made in this article start to override ideologically driven policies.